Once again, our culinary wizard, Jennifer Ozick, does not disappoint (see more about Jen in our “About Us” page). In a large skillet, over medium-high heat, brown meat. Add next 8 ingredients. Mix well. Continue to cook until bean sprouts are well glossed. Remove from heat. 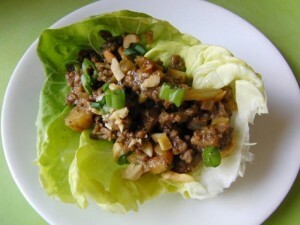 Spoon stir-fry mixture into the lettuce leaf. Wrap the lettuce leaf to enclose the filling. If you would like to kick-up the heat, add a drizzle of your favorite Asian hot sauce, such as; Huy Fong, Sriracha Hot Chili Sauce. Yum! This recipe is low in sugar, high in niacin, high in phosphorus, very high in selenium, high in vitamins B6 & B12, vitamin C and zinc! Talk about nutritious!